Will Cam Levins become Canada’s greatest distance runner? Rising high above the beautiful town of Cedar City, Utah, there’s a singletrack that winds through neighbouring canyons along an undulating 10-mile route. In some places, on either side of this red dusty trail, the cliffs sink 18 metres (60 ft) straight down, increasing its thrill for local runners and mountain bikers. The elevation hovers around 2,100 metres (7,000 ft) through these mountains. Despite the obvious physical challenge – and mostly because of it – this run, called “Razorbacks,” is one of Cam Levins’s favourites. It’s a run that the Canadian Olympian uses to test himself. Levins may not be a household name yet to the general population, but most running fans know him well. After the 23-year-old from Black Creek, B.C., excelled at his first Olympics in London, it’s not a stretch to say that this guy could become Canada’s greatest distance runner ever. There’s no doubt that training in the Rocky Mountains under suu coach Eric Houle has been crucial to Levins’s success. That’s why it caught many observers by surprise when Levins announced in November that he’s joining the Speed River Track and Field Club, which is based in Guelph, Ont. Speed River coach Dave Scott-Thomas will write Levins’s training program, but Houle will supervise the workouts. They will be co-coaches and Levins will remain in Utah. Levins was a star at Southern Utah, winning the 5000m and 10,000m at last summer’s ncaa championships. He set personal bests of 13:18.29 (5000m) and 27:27.96 (10,000m) in the same season. Then he tested his mettle against the fastest distance runners in the world at the Olympics. “The Olympics was an amazing learning experience to figure out how to race in these big races,” Levins explains. “I thought I had an idea from racing the guys at the ncaa but obviously these guys were at a totally different level than that. I knew all their times were a lot faster but they were just more dynamic racers too. I had never been in that sort of racing situation before. It was huge for me.” Because of some minor aches and pains after his ncaa double, he was unable to race on the European track circuit prior to the Games. Nevertheless, he handled himself rather well in London, finishing 11th in the 10,000m and then qualifying for the 5000m final where he finished 14th. When he won the Payton Jordan 10,000m in 27:27.96 on April 29 in Palo Alto, Calif. – his debut at the event – he used a 55-second last lap to cement victory. But now he knows he must get faster and stronger. Hence the return to the demanding runs along Utah’s high-altitude trails. Levins became a popular figure on campus. Many gathered to watch the Olympic 10,000m live in an suu auditorium wearing their red and white suu Thunderbirds t-shirts. They started clapping the moment he appeared on screen. Levins remembers entering the London Olympic stadium nervously to the roar of 80,000 people, then immediately spotting his parents, his brother and sister-in-law as well as coach Houle and his wife. The Olympic 10,000m race went out slow. But after the first 5000m in 14:05, the pace gradually wound up. The ninth kilometre was run in 2:46.48. Levins wasn’t dropped. He handled the constant surging, hanging onto the lead pack up until the final 500m, which was an achievement on its own. The second-last lap was run in 62 seconds. Britain’s Mo Farah covered the final 400m in 53.48 seconds to claim the gold medal. Levins had certainly proved himself on the biggest stage, though he admitted his inexperience limited him. Cam Levins – Canada’s Greatest Distance Runner? Racing the 5000m at the 2012 London Olympics. Finishing in 27:40.68, Levins had given up 10 seconds on the last lap to Farah, who won the race in 27:30.90. The final kilometre had been run in a mind-numbing 2:28:45. To illustrate the company he was suddenly keeping, Kenyan Moses Masai, a former world championship bronze medallist with a personal best of 26:49.20, finished just behind Levins while the Kenyan trials champion, Wilson Kiprop, didn’t even finish the race. The Olympic experience was about much more than racing. Levins met several world champions, including Farah and Bernard Lagat in the village cafeteria. He had hoped to race them in the post-Olympic Diamond League meets, but he picked up a chest infection the night before the 5000m final and decided to end his season prematurely. Levins grew up in Black Creek, B.C., a small community of about a thousand people, on Vancouver Island. He attended George P. Vanier Secondary School in nearby Courtenay, B.C. He trained alone through high school, mostly on forested trails near his home. When there were reports of cougar sightings in the area, he stuck to the roads in well-lit areas. He also had to be aware of black bears since they were also common in the area. During his summer holidays he helped his dad with a lawn care business and increased his mileage. His high school results didn’t bring any immediate scholarship offers, and Levins’s fourth-place finish at the B.C. championships hardly merited any attention from the larger ncaa universities. When he entered his credentials on a college recruiting website, Houle was the only one to offer him a scholarship. Houle, who had coached Jess Baumgartner to a third-place finish in the 2006 ncaa cross-country championships, brought Levins down for a campus visit. As they drove three hours from the Las Vegas airport across the desert and northeast along Interstate Highway 15 into Utah, they spoke about dreams. Houle likes to give motivational speeches, but he also uses them to get a read on his athletes. His gut told him this young man was coachable. In turn, Levins also liked the idea of doing speed training at an elevation of 900 metres (3,000 ft) on the f lat lands, while going up as high as 3,000 metres (10,000 ft) into the mountains to benefit from the higher altitude. It didn’t take long before he committed to the little-known school of 7,000 students. At the 2011 NCAA cross-country championships, Levins placed fourth and then successfully defended his Canadian cross-country title six days later in Vancouver, running for the Comox Valley Cougars. Despite the marathon-type training he had been doing, he recorded fast times during the 2012 indoor season: 3:57.14 for the mile and 7:45.75 for 3000m. Clearly, there was more in the tank. Once Levins finished his ncaa eligibility in the summer, he signed a contract with Flynn Sports Management. Ray Flynn, a former world-class miler, has managed several top athletes, including American miler Alan Webb and Canadian sprinter Donovan Bailey. Levins is now in the middle of a four-year contract with Nike that will ensure he’s financially stable through the next Olympic cycle. As he prepares for the 2013 season, Levins has been slowly increasing his training volume to the level it was prior to the Olympics. He believes he can handle the volume and speed work necessary to become more competitive at the world championship level. “I haven’t been super concerned about my total weekly mileage,” Levins says. “I have been trying to string together a couple of 30-plus-mile days in a row just to get my body ready. Last year, my highest ones were 25 to 30 miles.” Scott-Thomas planned to visit Levins and Houle in Utah following the Canadian crosscountry championships in December. It’s unclear how or if his training might change. Levins probably has a bigger following in the United States because of his NCAA success. He’s a major draw on the popular U.S. running message board letsrun.com. Now that his collegiate days are behind him he intends to race as often as possible in Canada, likely one of the reasons he joined Speed River. He recently won the 2012 Canadian cross-country championships and is considering both the Vancouver Sun Run and the Ottawa Race Weekend 10k for the spring. He believes he has much more to accomplish on the track as well. Looking ahead, he realizes that the 10,000m has become his best event, but he has no intention of giving up on the 5000m. “I really feel that I can drop that 13:18.29 (5000m PB) down far more, equivalent to what I can do in the 10k. 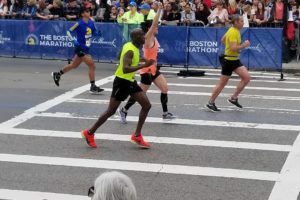 I think there is great potential in both.” Beyond that, many observers, including 2012 Boston Marathon champion Wesley Korir, believe Levins would make a great marathoner once he’s done with the track. With a new shoe contract, new agent, new club and the comfort of knowing that he’s on the right path to being a worldclass runner, Levins is expecting another great year ahead. Now, if he can only improve his skills in the kitchen. Amazing guy…this Canuck is behind ya Cam!